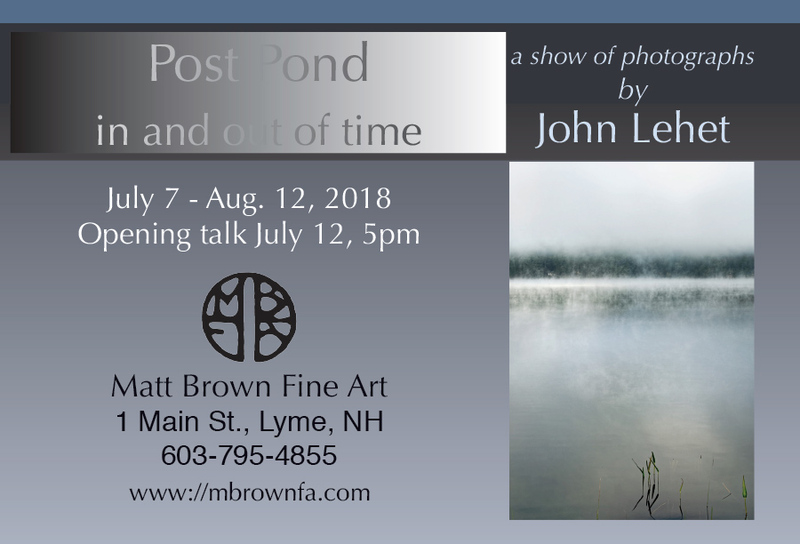 I’ve been working hard on the upcoming Post Pond show, at Matt Brown Fine Art in Lyme New Hampshire. I’m excited to share the space with Matt’s woodblock prints, other great contemporary artists, and also old woodblock prints. Matt is collecting and dealing Kunisada woodblock prints, among others — those are really something. Matt asked me to make a show of my time in Lyme and to focus it around Post Pond and its immediate watershed. I spent a lot of camera time around Post Pond, the meadows near it, and the inlet and outlet streams: Trout Brook and Clay Brook. Poet Jim Schley and I are going to give a talk, roughly around the notion of Time. I touched on that in my last post. Passing through time is always interesting, and certainly no less as a photographer. 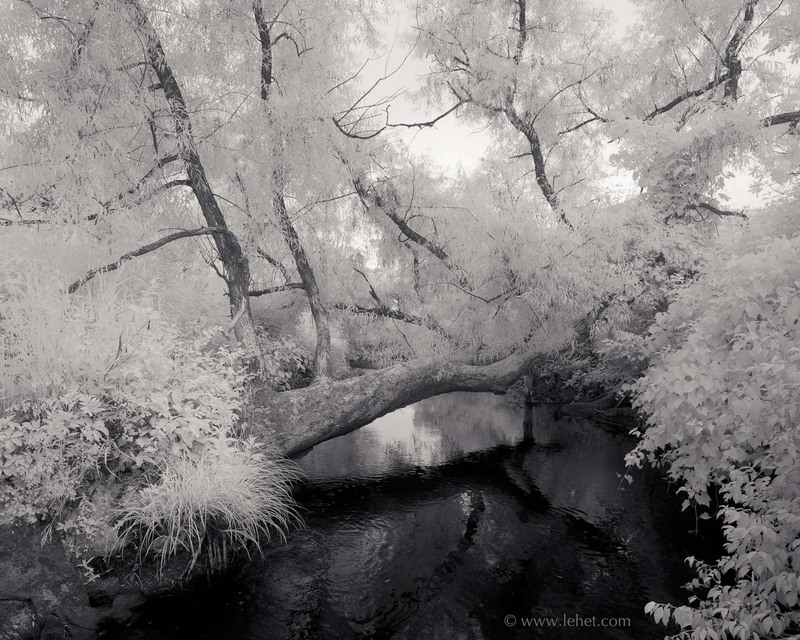 All those older images represent both a period of artistic development as well as emotional experience. Also of course a record of the world passing through time, weather and light and atmosphere, as well as physical artifacts like trees that will change. One big dead tree that is prominent in many of my photos of Trout Brook no longer exists. The leaning tree above is a different story. Above, in about 2006, that tree had been leaning for a while. Below, in 2016, it was a bridge across the stream, completely fallen. I don’t know how it survived last winter or spring’s high water. No doubt it is different still. As the Buddhists say, annicca, annicca; impermanence. Everything is impermanent. Especially the state of my mind in the early 2000s when I lived near that spot. And yet, here are some photographs. A reflection of my mind when I lived there, a record of the phenomena in front of my camera, a print that exists and resonates in this moment — and, really, nothing at all. Illusion. But illusion fun to play with. All life is a dance with illusion, so let us dance onward. Oh, and a news flash: I will be a featured artist at the rest area in Hartford on Route 5 in Vermont. Starting tomorrow, July 1, through the month. Those photos will not be Post Pond. 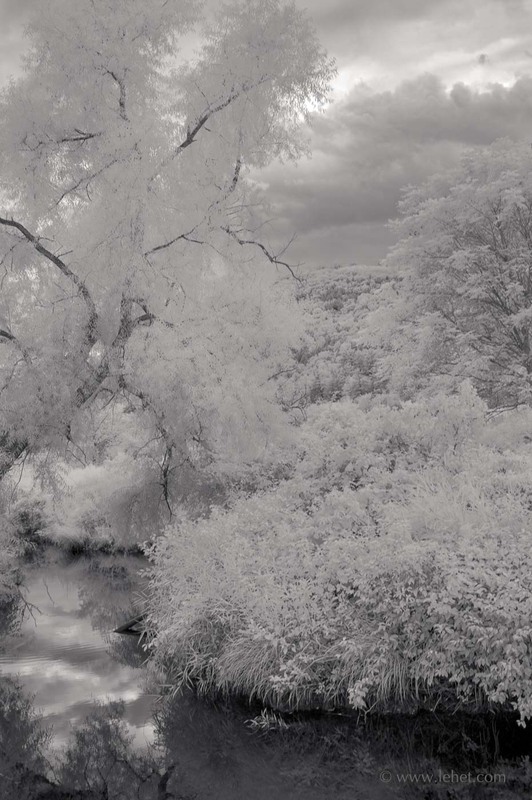 This entry was posted in Exhibition, Infrared, Musings, New Hampshire, Post Pond on June 30, 2018 by john lehet.